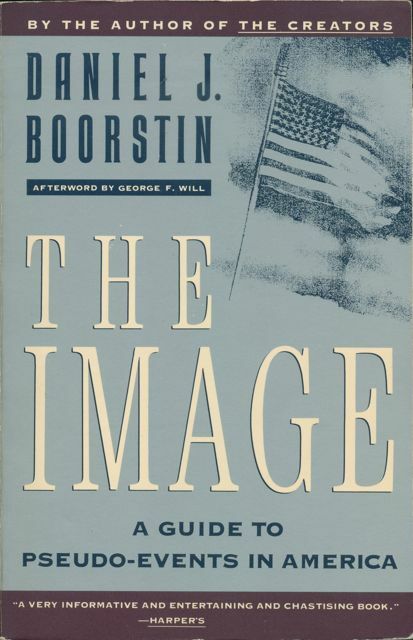 I first read Daniel J. Boorstin’s 1962 book The Image: A Guide to Pseudo-Events in America a dozen years ago in this Vintage International 25th anniversary edition dating from 1987. Although it’s now been half a century since the book came out, no 50th anniversary edition seems to be in the works – which seems unfortunate, since it is certainly a worthwhile read. The Image provides a remarkably lucid overview of “pseudo-events”, i.e., events such as press conferences or presidential debates manufactured for the sole purpose of being reported. Paradoxically, as Boorstin points out, since these pseudo-events are more controlled than ‘natural’ events, they “tend to be more interesting and more attractive than spontaneous events”, thereby threatening the very reality of our reality. 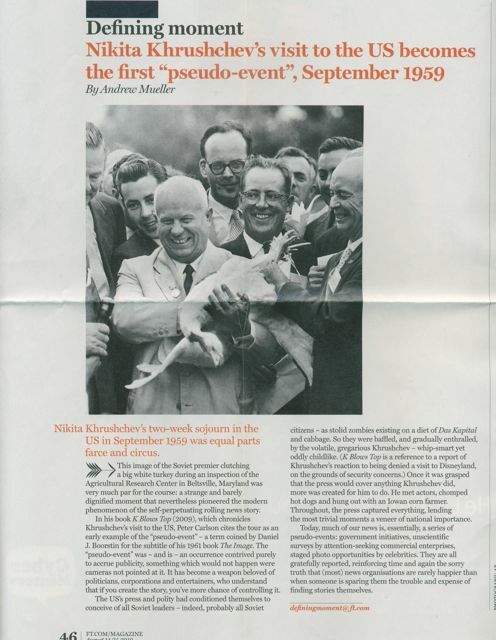 Boorstin covers a wide range of pseudo-events. The celebrity, the “human pseudo-event”, is nothing more than “a person who is known for his well-knownness”. The biggest news about Charles Lindbergh, he writes, “was that he was such big news”. Boorstin also surveys tourism (providing insight into the rise of the Thomas Cook travel agencies and Baedeker guide books), literature and the arts (from best-sellers to the music provided by the Muzak Company – “music to hear, not to listen to”) and business (noting that in the 1950s already, most people “like advertising [and] expect to find it in their magazines”). In the last chapter, Boorstin evokes the “menace of unreality” that threatens America, “the danger of replacing American dreams by American illusions”. Today, much of our news is, essentially, a series of pseudo-events: government initiatives, unscientific surveys by attention-seeking commercial enterprises, staged photo opportunities by celebrities. They are all gratefully reported, reinforcing time and again the sorry truth that (most) news organisations are rarely happier than when someone is sparing them the trouble and expense of finding stories themselves. The “menace of unreality” Boorstin evoked in The Image is as present now as it was then, and Boorstin is clearly as relevant today as he was in 1962. Update: since writing this post, I’ve learned that a 50th anniversary edition has in fact been published by Vintage, which is great news. It’s definitely worth reading. This entry was posted in Daniel J. Boorstin and tagged Daniel J. Boorstin, Pseudo-Events, The Image. Bookmark the permalink.